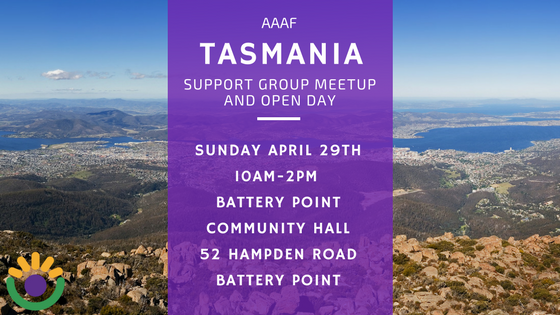 The AAAF Team are heading down to Hobart on Sunday the 29th of April to host our first ever official event in Tasmania. This event is a fantastic opportunity to make friends and forge connections with other individuals and families living with alopecia, and they’ll be time to ask all your alopecia questions with our expert team. We’re also bringing some friends with us – wig makers and other specialists who work with the alopecia community and can answer all your questions and show you whats new. If you’ve ever wanted to know more about alopecia, discuss options for wigs, or just meet with others with this condition in a safe and friendly environment, this is the event for you. It’s totally free to come along, and plenty of room for everyone – families and friends, including kids, very welcome to come along too. We encourage you to rsvp by emailing chel@aaaf.org.au or visiting our Facebook Event so we have an idea of numbers, and save the date for the 29th of April. We can’t wait to see you all. Angela from Angel Wigs specializes in suction base human hair wigs, and is a long time supporter of AAAF. She’ll be able to tell you all about the state of the art scanning process and how these custom wigs are created. Rani from Perret-Dermatech is a Hobart-based cosmetic tattoo artist. The team at Perret-Dermatech specialize in microblading to create natural looking brows and lashes. Rani is happy to answer any questions about cosmetic tattoos. Lisa from Energy of One Yoga will be hosting a relaxation session and helping us find simple tools to improve well-being. Lisa will teach you how to use yoga from the mat or from a bed or chair – No funny positions. Just easy stretches and breathing techniques that help relax, re-charge and release tension. Sofy and Sarah from R&Z Glam Wigs will be able to talk to you all about their range of beautiful human hair wigs. They are travelling with us from Melbourne and are excited to be able to share their knowledge of wigs with our community in Tasmania. AAAF will also be bringing items from our E-store. Wigs, scarves, swim caps, temporary brow tattoos and more will be available for you. All synthetic wigs will be available at the very low price of $30. All sales will be cash only, so please come prepared. You are welcome to view the items on our e-store and request items to be brought to the event. You can find our e-store here, and you can contact chel@aaaf.org.au to request items directly.